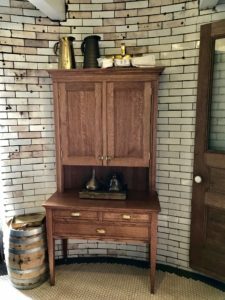 Remember the oak cabinet that Cousin Kenny built for us? Well we finally brought it out to Graves this week, in two pieces, and set it up on the first floor. It’s an exact copy of the 1905 “Service Cabinet” used at Graves to organize the oil lamps and their gear. 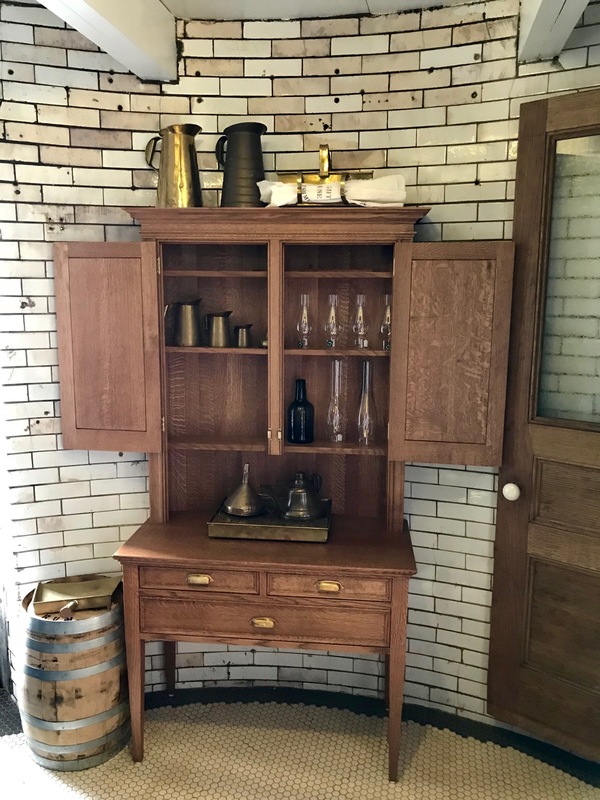 We have put the cabinet to its original use. 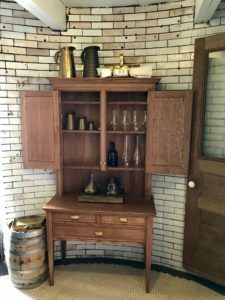 As seen in the picture, it now stores genuine, antique, US Light House Service oil pitchers, wick maintenance kit, glass lamp chimneys, and other equipment. 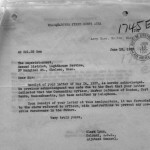 The US Coast Guard provided us with the original plans from more than a century ago. 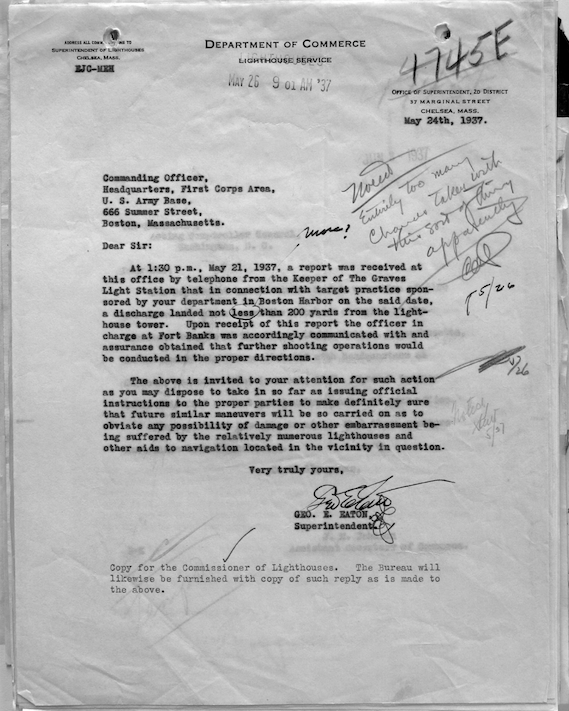 Kennedy made this exact replica, to precise specifications, from the Coast Guard plans. 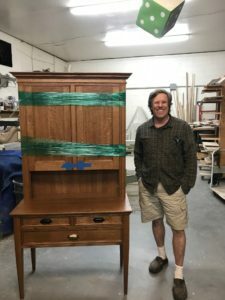 Kenny at the firehouse with the exact replica cabinet he built in Connecticut. Hoisting the cabinet from the dinghy to the dock. In its new and final home, the first floor of Graves Light. Storing antique, original US Light House Service oil cans and lamp parts. This original Graves Light checkerboard, made by Keeper Llewelyn Rogers in the 1930s, was gifted to Graves Light by the Rogers family in 2018. It’s often said the best part of owning Graves Light is meeting interesting people. Bruce at the UPS Store, delivering the checkerboard to Graves Light. We just had the good fortune to hear from wonderful Molly and Bruce Nichols in New York state. 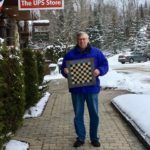 Molly’s mother received an antique checkerboard from her aunt Catherine in Wellfleet back in the 1970s. 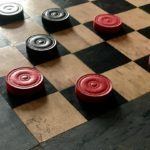 Well, it didn’t take us long to buy a proper vintage checker set on eBay to go along with the handmade checkerboard so the keepers at Graves can use it again. Now the set is returned to the Graves Light watch room, waiting for a cozy game by the fire in our potbelly stove. 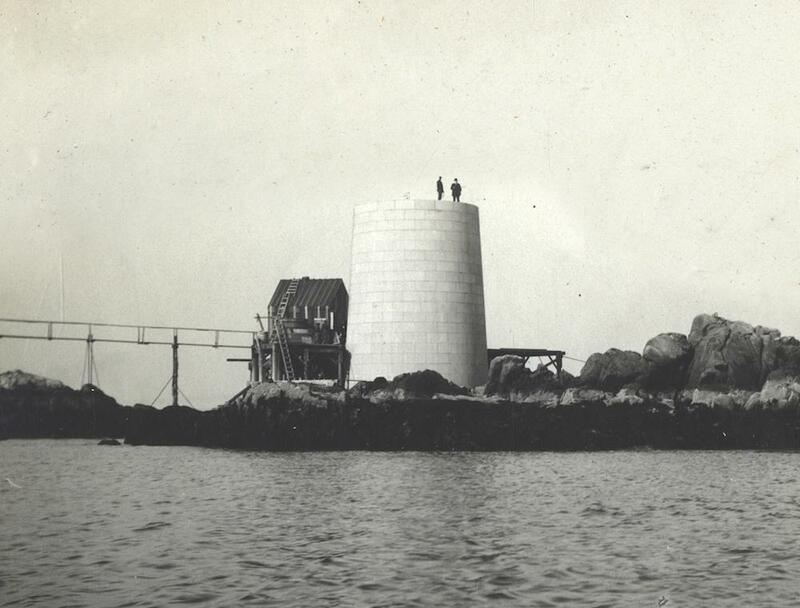 A note about Keeper Llewellyn Rogers: Born in Maine in 1885, Rogers moved to Provincetown as a boy and worked for the Lighthouse Service for 17 years. 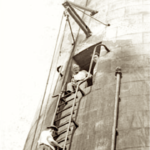 He was first stationed at Minot’s Light, then Twin Light, Boston Light, Provincetown Light and finally Graves Light, where he was Graves’ last Keeper under the US Lighthouse Service. He is standing in the doorway in the 1941 photo below, taken by the prolific Edward Rowe Snow. 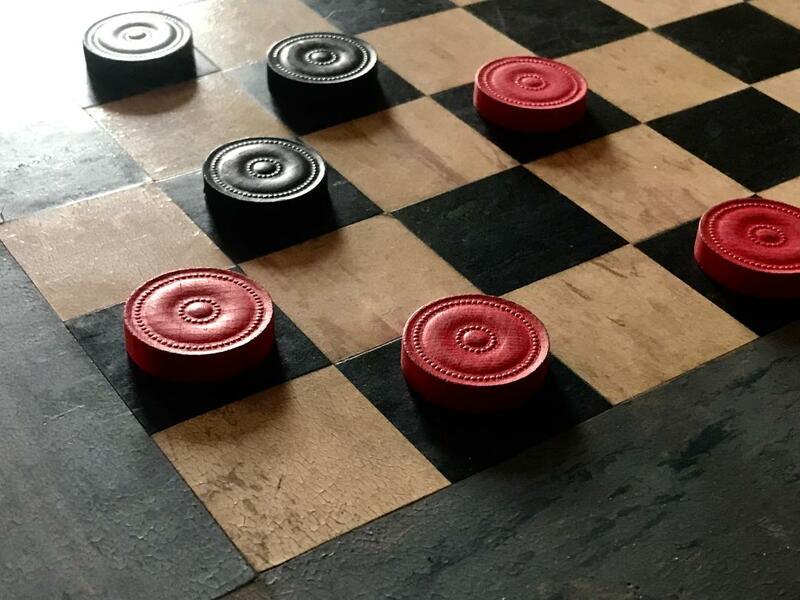 Keeper Rogers made this checkerboard using scraps of leftover linoleum from the kitchen floor. 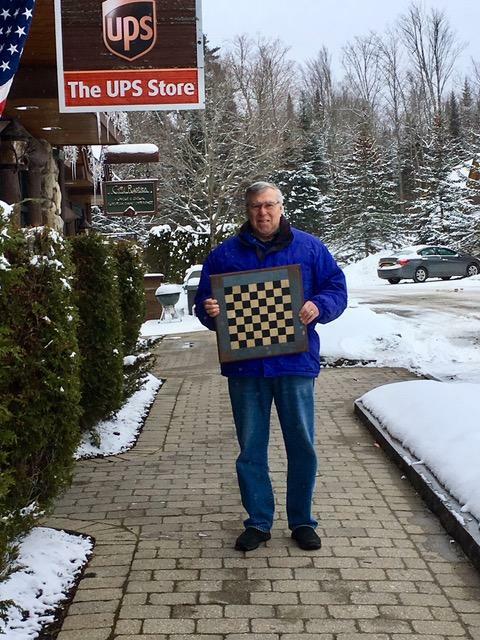 The snowy photo shows Bruce readying the checkerboard for shipping to us. 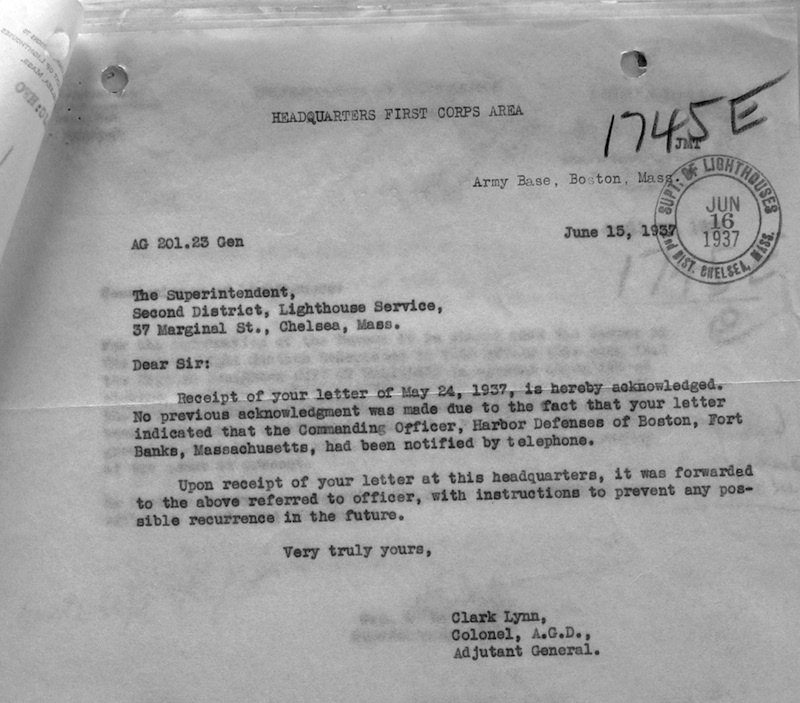 The inscription on the reverse of the Rogers checkerboard. 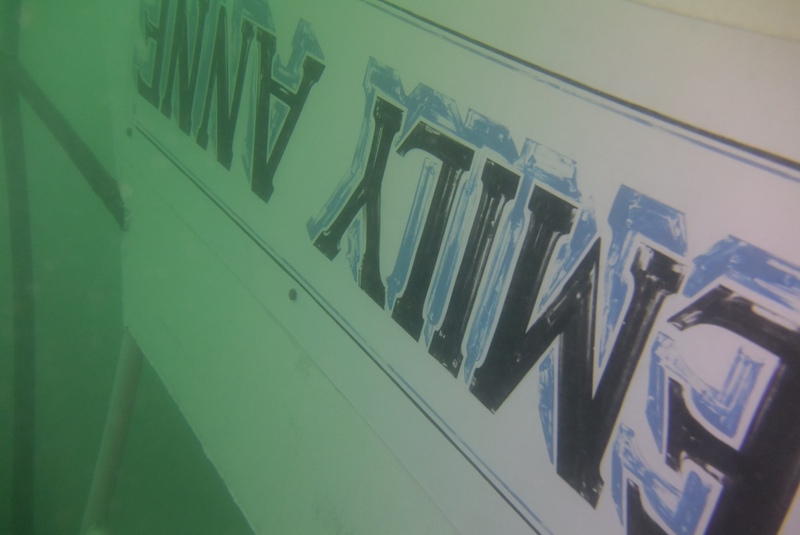 The wrecked Emily Anne sat upside down in 50 feet of water. 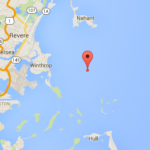 The realities of the sea and weather remind us that not everything’s as fun as it seems at the mouth of Boston Harbor. A salvage team just raised the wreck of Emily Anne, the trusty tugboat that helped us with restoration work in 2014. The tug sank just north of Graves Light in February, 2016. A quick-thinking pilot boat captain saved Emily Anne‘s crew as she sank, upside-down, in 50 feet of water. 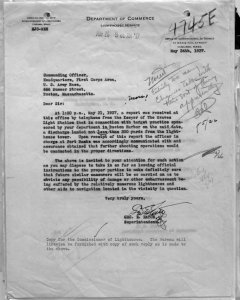 Because the hulk was so close to the North Channel, the Coast Guard recommended that Emily Anne be raised so it wouldn’t be a threat to navigation. 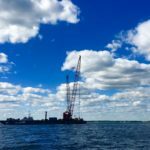 And so she was, in early June, with a crane pulling her to the surface and placing her on a barge. 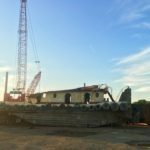 From there, the barge took Emily Anne to a graving yard in Chelsea, where she’ll be broken up and sold for scrap. 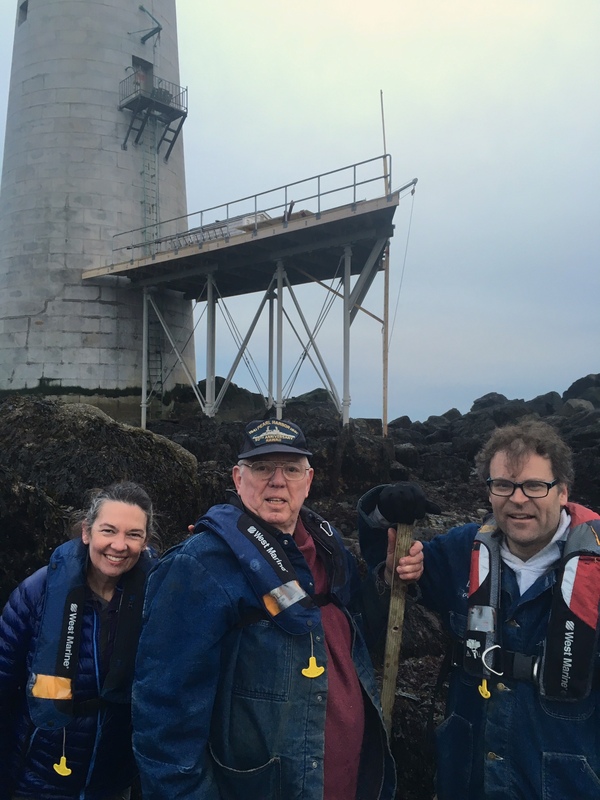 These pictures tell the story of the salvage operation, with a couple shots from happier days when she helped with the Graves Light restoration in 2014. Emily Anne’s remains are raised from the bottom to be hauled away on a barge. 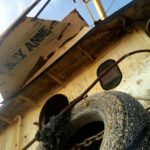 Sitting in the Chelsea salvage yard, her top deck gone, Emily Anne waits to be scrapped. 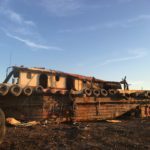 The end of the tugboat that helped restore Graves Light. Location of the wreck, February 2016. The tugboat Emily Anne as she brought a barge and crane to assist with the Graves Light restoration in 2014. Emily Anne takes the spud barge and crane out to Graves, 2014. On the deck of Graves Light for the first time since 1975, engineer Ron Fiore explains to Dave how he devised the system to remove the original Fresnel Lens from Graves. Well, the best part of this whole lighthouse experience continues to be all the great people we meet. Today we met Ron Fiore, the structural engineer who devised the method of removing the gigantic First Order Fresnel lens back in 1975. That lens blasted out a 3.2 million candlepower beam for 70 years straight. 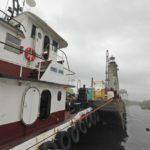 The lamp required a full-time crew to operate and maintain, so the Coast Guard had it taken out and replaced with an automated electric beacon. Ron told us all the details about how he built a custom crane to gently lower the priceless lens – it weighed 2 tons and measured 12 feet tall and 9 feet across – down one story into the watch room. 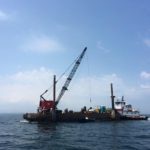 Then he and the crew removed part of a wall to slide the lens past the sloping tower and drop it 60 feet to the dock, where a Coast Guard boat plucked it onto the deck. 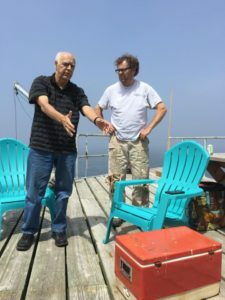 Legendary New England maritime history author Edward Rowe Snow made an appearance, instructing the crew to wave (as he was filming the feat) but the workers were too busy – and scared – to respond. The next year Ron and his wife visited the lens again, this time at the Smithsonian! The Fresnel lens was made in France by Barbier, Benard & Turenne in 1904, and was installed in 1905. After the 1975 removal, the Coast Guard installed an automated electric beacon, powered from land by an underwater cable. That cable broke, so in 2001 the Coast Guard installed the present solar-powered lamp, the Hydrosphere Vega VRB-25, made in the U.K. 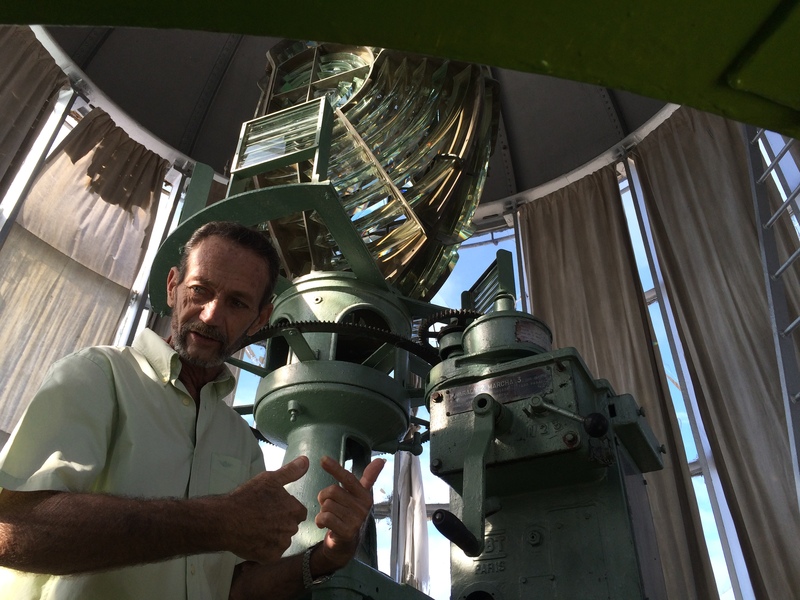 The keeper of the Castle Morro lighthouse in Havana, Cuba, shows us the original 1845 Fresnel lens. Manually wound every 3 hours, the lens sits on its original pool of mercury for smooth rotation. 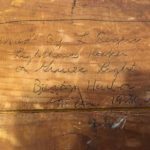 As authentic as it gets: Graves Light got an up-close look at the historic 1744 Castle Morro lighthouse in Havana harbor, Cuba, and saw an original Fresnel lens in about as original a state as possible. 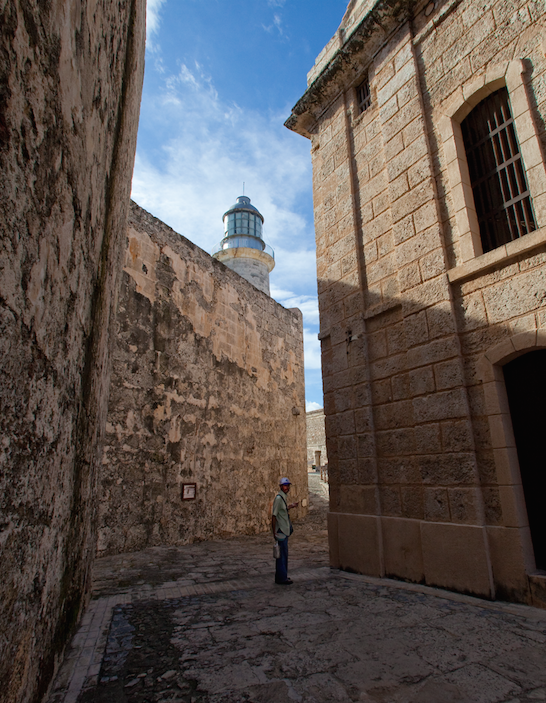 Enrizio, keeper of the Havana lighthouse, takes us on a visit through Castle Morro. 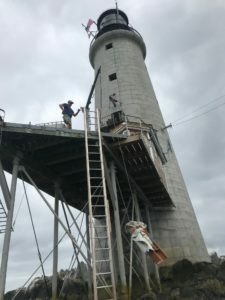 On a quick visit to the island last weekend, Graves Light keepers Lynn and Dave talked their way into the lighthouse just as the Morro keeper was reporting for duty. The light is closed to the public. Lunchpail in hand, Enrizio, the friendly keeper, gave us fellow keepers a tour and took us up to the lantern room. It was like climbing back in time. What appears to be the original Third Order bivalve Fresnel lens is still in operation. The lens was made in about 1845 by BBT Paris, the same manufacturer of the old First Order lens at Graves Light, which is now at the Smithsonian Institution. The keeper fired up the early hand-cranked motor that spins the lens, which still floats smoothly on its mercury bath. Half the windows in the lantern room are cracked or broken out, but the lens produces a brilliant double white flash every 15 seconds. The mechanism is still manually wound every three hours. The lens was modified by “the French” in the 1950s with the addition of small reflecting panels to bend some of the beam 45 degrees upward so that aircraft could navigate by its light. Other than those panels and an electric lamp that uses a 70 watt halogen bulb, the entire apparatus appears completely original. Each evening, the keeper withdraws the curtains and engages the mechanism to spin the lens. By day, the curtains are drawn to prevent the sun from entering the lens and starting a fire inside. L’Hermione passes Graves Light while entering Boston Harbor. Photo by Richard Green. What an exciting Independence Day we had this year, with a visit from the French sailing ship L’Hermione. 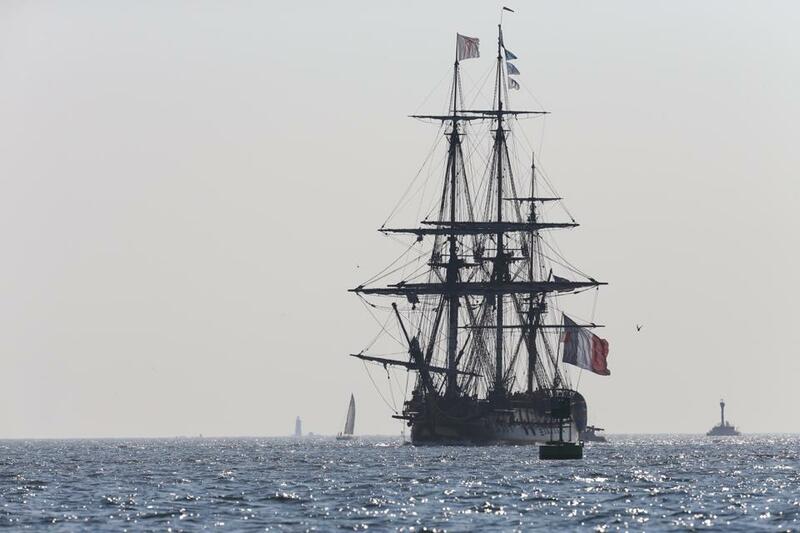 A new reproduction of the French warship that the great Marquis de Lafayette took to America to announce France’s military support for the American Revolution, L’Hermione paid a goodwill visit to the east coast of the United States this summer. 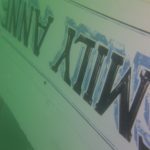 We first caught up with L’Hermione during its visit to Baltimore, toured the ship, and talked to the captain and crew. 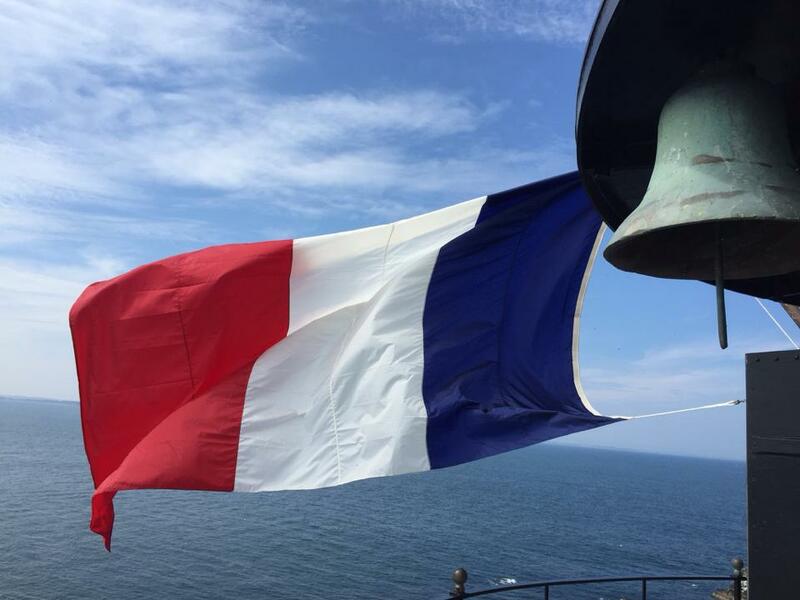 When L’Hermione made its way north and arrived in Boston Harbor on July 10, Graves Light saluted her with the French tricolor. L’Hermione responded with a tweet. It was a great occasion to commemorate Lafayette’s historic voyage and show her our appreciation to France for saving our new country during the American Revolution. 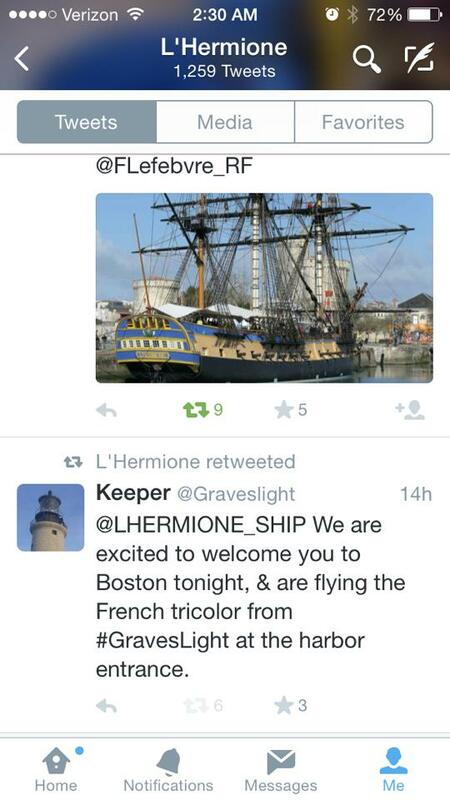 L’Hermione retweeted our tweet welcoming her to Boston Harbor. 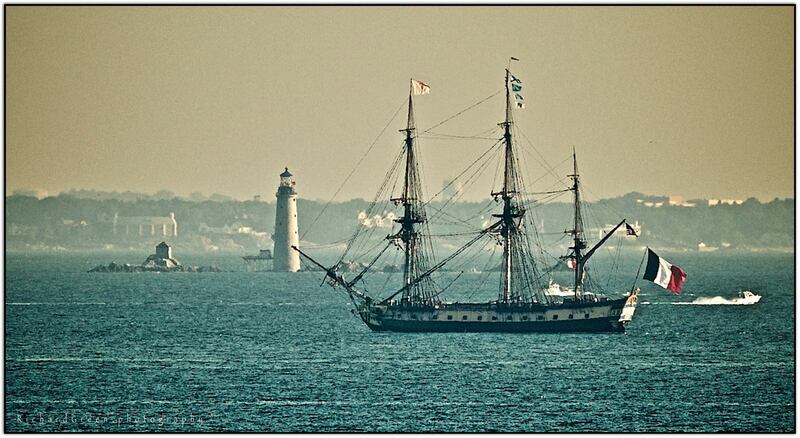 Graves Light flies the French tricolor for a day to welcome L’Hermione to Boston. L’Hermione passes Deer Island on her way into Boston Harbor. Graves Light is on the horizon, at center-left.